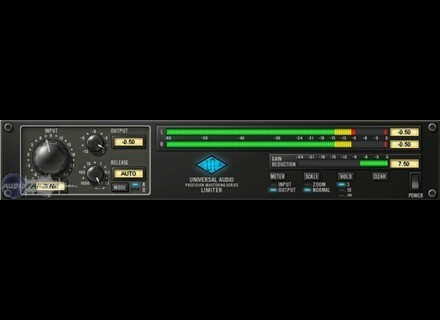 Precision Limiter, Software limiter from Universal Audio in the UAD Plug-In series. Purchase plug-in, unlock via authrisation file, ready to go. The Universal Audio Precision LimiterTM is a single-band, look-ahead, brick- wall limiter designed primarily for mastering with program material. The easy- to-use Limiter achieves 100% attack within a 1.5ms look-ahead window, which prevents clipping and guarantees zero overshoot performance. Both the attack and release curves are optimized for mastering, which minimizes aliasing. Since the Precision Limiter is a colorless, transparent mastering limiter–no up- sampling is used, nor does the UA Precision Limiter pass audio through any filters–audio remains untouched unless the compressor is working, in which case only gain is affected. To really be considered a professional limiter, the metering needs to be su- perb. The Precision Limiter features comprehensive, high-resolution metering and conforms to the Bob Katz “K-System” metering specifications. This meter- ing allows the user to see what is happening to audio with a great deal of ac- curacy, with simultaneous RMS and Peak metering and adjustable Peak Hold. And since we know how valuable good metering is, the plug-in can also be bypassed and used strictly as a high-resolution meter. Key features include user-adjustable Release or intelligent Auto Release, which allows for fast recovery–minimizing distortion and pumping–and a unique selectable Mode switch, which allows you to delicately tailor the at- tack shape and control the “presentation” for different material. Mode A is the default shape, suitable for most material, while Mode B can be particularly useful on minimal and/or acoustic program material, yielding a more subtle touch. The Precision Limiter is yet another indispensable UAD tool for your audio arsenal. The Precision Limiter has a 1.5ms look-ahead window to ensure clipping does not occur. This look-ahead function results in a slightly larger latency than other UAD plug-ins. mk-lover's review (This content has been automatically translated from French)" limiter incredible!" the facility is spotless, the problem is simply a quick click on it and autorizations in! I use it on a Power Mac G5 Dual 1.8 ghz pro, uad the app is very stable, I use it with ProTools 7.4 on Tiger and everything runs (it's so stable that I will not update ). I've had it yesterday and I quickly realized that this was no joke, the limiter works of hell, the more the signal and magnificent, he embellishes the mix slightly, uad it's serious I ' I also tested the LA 2A is amazing, I'm staying idiot! because I did not expect such a result from a plug, I was more on the history of septic uad plug but I confirm, it's AWESOME. Before I used the limit of Sonnox it also and it is transparent (it is in some cases) and high amount of input gain can become hard and absorbent on the bottom of the spectrum here is any way this kind of plug should be careful of the gain otherwise it can become a nightmare. if you have a uad card and you want a limit hesitate even one second is the class. Simple, stable, easy to use. Nearly impossible to use the plug on a single card after completing the mix because he is greedy. Therefore one or more UAD UAD-2 ... or bouncer mix before the "brickwall limiting". This tool is of great blocks! Just give him the "headroom" for it to work but it is a must. Everything is perfectly stable, since running UAD-1. This limit mastering maximizer of Waves Drive the LTD, which is saying something considering the quality of these! But at levels where the same L2 and L3 eventually give soup, P. Limit is always the way! But for the price of an L3 you have a card UAD-1 accompanied by multiple plugins much better, think about it! Amazing! Can not live without it!